We were ready to take on the rest of Turkey, although saying goodbye was a little bit sad because the stay at Ali, Martin’s ex-colleague, had been very nice. Also we had the experience of cycling into Istanbul vividly in our minds. Luckily the way out of Istanbul was a lot more pleasant while following the old Ankara road. The morning was a little overcast when we left but it was nice and cool and we had decided to make it an easy day to get going again. We left Uskudar, went up the hill to go down again and headed over to the bicycle shop. A part that had broken on Martin’s bike fell under guarantee from Santos and we received money back and had time to drink some cay. 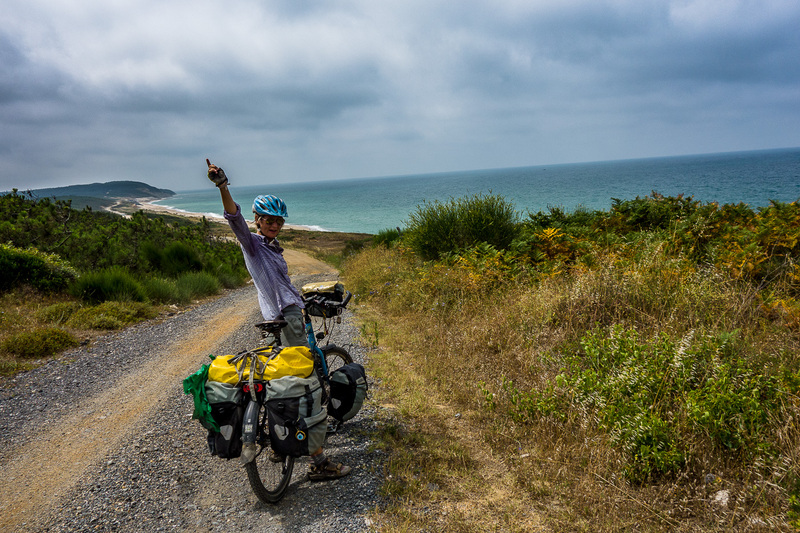 We followed the coast downwards and were amazed to again find a bicycle path all along the coast. The only thing was that this bicycle path with many side roads, giving access to car entrances, sometimes stopped all together. We then had to access the road to pick up the bicycle path 500 meters further again. Well why complain we had an easy ride. We took the easy way by taking a ferry across to Yalova and this way finding the old Ankara road, avoiding any major highways in the area. We arrived at 14:05 and the ferry had left at 14:00, so we could wait till 15:15 for the next and have lunch in the meantime. The ferry took 45 minutes and we were on the other side. The following days were actually quite divers. After arriving by ferry we cycled uphill to go down again to a lake where we tried to find a camp spot. We found three men from Iraq and Syria who worked for a fishing company, living in a container and were very welcoming. They had a whole freezer full of fish and were proud of it! We could camp next to their land and they gave us yoghurt and of course cay. The next day when we packed up they had already left for work. Hard working guys. We came through Boyalice which had a really nice view of the lake. We were invited for cay by a man. He apparently was a journalist and wanted to know all about us, but didn’t speak English. Our Turkish is also a bit rusty, but we managed to talk with hands and feet and hope he got a good report out of it. He also made some pictures of us. 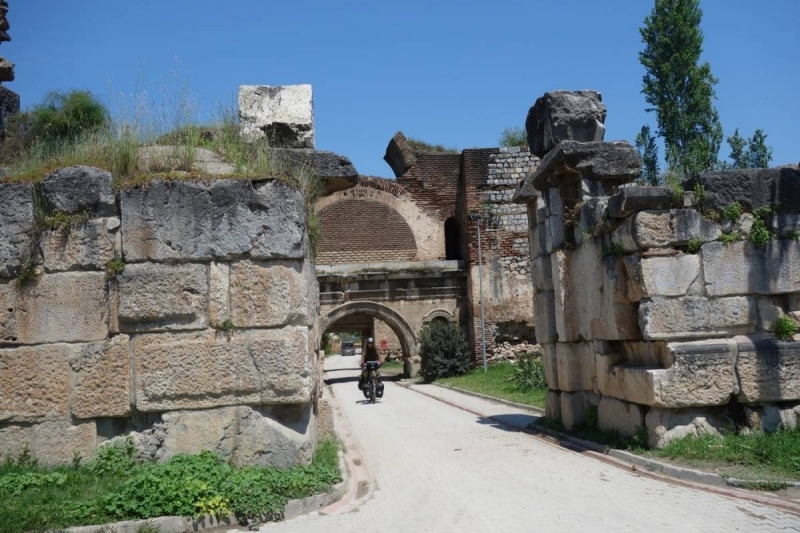 We then cycled through the village of Iznik, which looked really nice with old gates at the edge of the village. From there we crossed over some hills and had a great descent (with multiple 10% sections) down to a main road. It is hard to judge the roads in Turkey. Some look really small but are big and the other way a round. Here we were waived down by two guys for cherries and we received a bag to take with us. Really nice! We pushed through on this big road until the junction, which was further than expected. Then the junction was very busy and we were done with cycling and not sure where we would find a camp spot. So we asked the petrol station if we could camp there. Yes, we could! (or problem yok, common words to hear here in turkey). The road from then on was getting more and more beautiful. Our highlights were the small city Goynuk, where we had to descend early in the morning for groceries, with nice traditional houses and small shops (really hard to get back on the main road again though); the lush green valley before Nallihan and the nature area in the neighbourhood of Cayirhan, also called bird paradise. 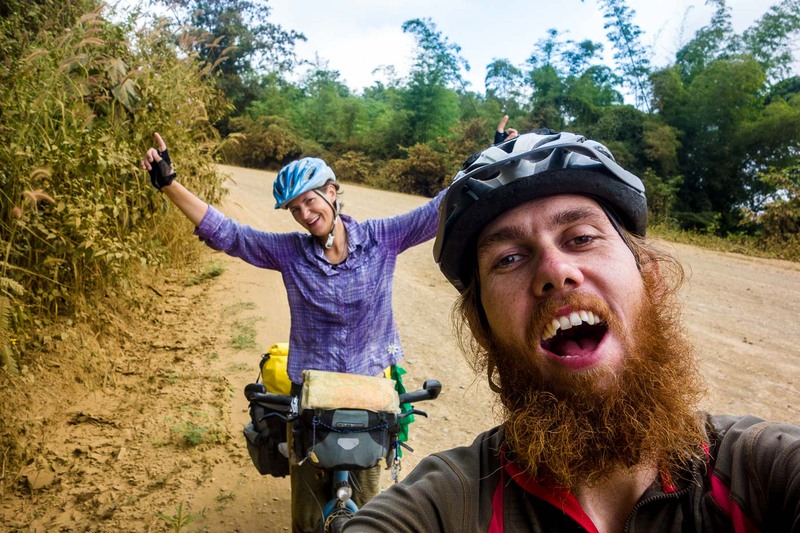 Just before we had reached Nallihan we coincidentally ran in to a fellow bicycle tourer Mo from Germany. We had stopped at a petrol station and he had seen us ride in and followed us. It was around 18:00 so he suggested we should camp together, although he was going the other way. We cycled on together and found a great spot in the valley next to a small river that we had to cross. It was our first river crossing, still a learning experience. At least we learn new things everyday 🙂 It was nice to talk an evening together about our experiences, our gear, our way of viewing the world and the countries ahead, because Mo had been cycling from China to here in about 10 months. Really nice to reflect with likeminded people! Early next morning we packed up camp, all did some maintenance on the bike, fixing a tire for Mo and cleaning the chain for us and we set of in different directions. The next two days were less eventful, mainly cycling through pretty scenery, through hills and city suburbs of Ankara. We had a really nice quiet camping spot on a top of a hill with a great view. In the morning we met a turtle on our way back to the road. He must have been really old and very happy in his environment. 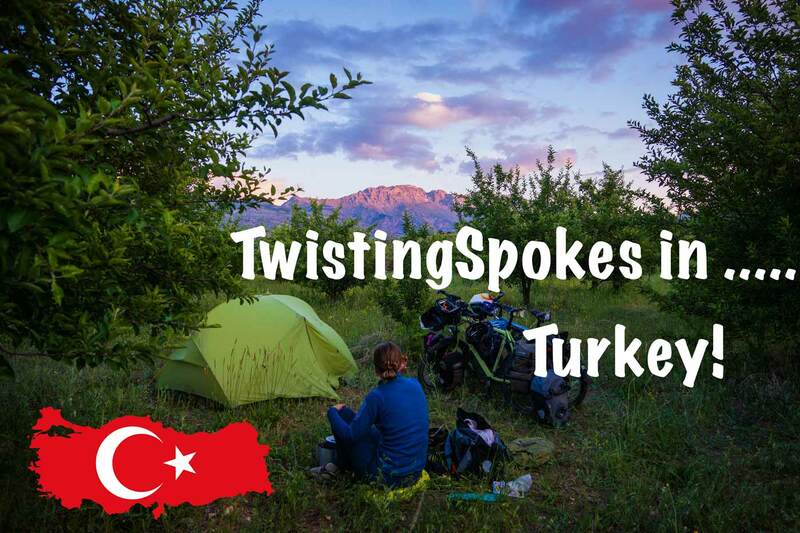 We had arranged with a Warmshowers host in Ankara, recommended by Mo, to be in Ankara the next day which meant we had a full on day ahead of us. We had heard Ankara was busy, but way less busy than Istanbul. Well our experience is different and we had an intense afternoon cycling through traffic. We did a full on 100 km of cycling, had a puncture in the blazing sun which we fixed and our hosts house was a little hard to find on top of a hill but we made it there by 19:30 and we were relieved. Susanne got a fever and now we are still in Ankara with our really friendly host Sabit. Martin has done some sightseeing and we are both enjoying the company and Turkish culture. Our Route from Istanbul to Ankara. I was thınkıng of gettıng the ferry to Yalova too. I’m takıng notes on your route :)) stıll a couple of weeks before I’ll be leavıng İstanbul though. Have fun, and I hope you have recovered from your fever Susanne!